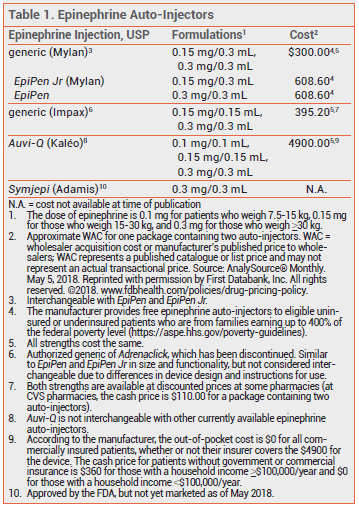 In Brief: Auvi-Q Epinephrine Auto-Injector for Infants and Toddlers | The Medical Letter, Inc. The Auvi-Q device is about the length and width of a credit card and as thick as a cell phone. It has an automatic needle retraction system and a red safety guard at the needle-end of the device. Removal of the outer case initiates visual signals and an audio recording that provides step-by-step instructions and a 2-second countdown during the injection process. Auvi-Q 0.1 mg is supplied in a carton containing two single-use auto-injectors and a training device without a needle. The outer case protects the epinephrine solution from light; exposure to excessive heat or cold should be avoided. The shelf-life of the epinephrine in the auto-injector is 18 months. All three strengths of Auvi-Q are priced the same. Drugs for allergic disorders. Med Lett Drugs Ther 2017; 59:71. SH Sicherer and FER Simons et al. Epinephrine for first-aid management of anaphylaxis. Pediatrics 2017; 139:e20164006. S Lee et al. Update on biphasic anaphylaxis. Curr Opin Allergy Clin Immunol 2016; 16:346. H Kim et al. Inadequacy of current pediatric epinephrine autoinjector needle length for use in infants and toddlers. Ann Allergy Asthma Immunol 2017; 118:719. S Dreborg et al. Epinephrine auto-injector needle lengths: can both subcutaneous and periosteal/intraosseous injection be avoided? Ann Allergy Asthma Immunol 2018 Feb 27 (epub). FE Simons et al. Epinephrine absorption in children with a history of anaphylaxis. J Allergy Clin Immunol 1998; 101:33.